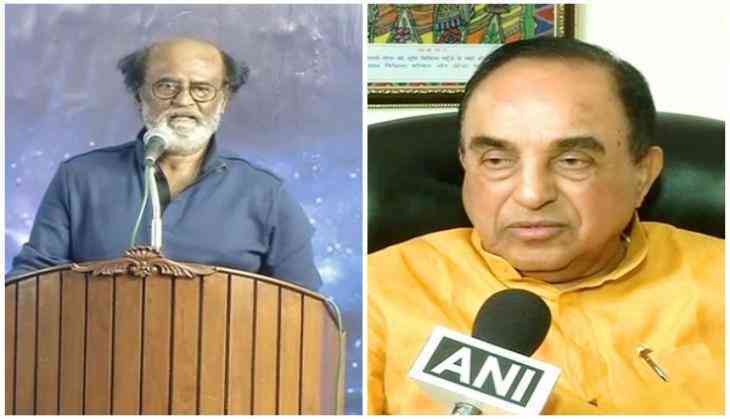 With the buzz surrounding superstar Rajinikanth's possible entry into politics, Bharatiya Janata Party (BJP) leader Subramanian Swamy on Friday downplayed the entire see-sawing development saying he is 'unsuitable' for becoming the chief minister of a large state like Tamil Nadu. "He has no future in politics. A new generation of very educated tamilians who are assertive, who are of influence and they want now national politics to come to Tamil Nadu. He is unsuitable for becoming the chief minister of Tamil Nadu," Swamy told ANI. Continuing to maintain his see-sawing attitude towards the recent criticism over his remarks on joining politics, Tamil superstar Rajinikanth on Friday rhetorically said the people would see what happens when the 'ultimate war' comes. "I have responsibilities and works, same with you. Let's do it, but when the ultimate war comes, we all will see," he said. The actor was possibly reacting to Bharatiya Janata Party ( BJP) leader Subramanian Swamy's remarks dubbing him as a 'disaster' in Tamil Nadu politics. The superstar also expressed his disappointment over the 'wrong system' which needs to be changed. While mentioning the names of eminent Tamil politicians, Rajinikanth said those people are able administrators but the 'wrong system' does not let them work properly. Rajinikanth further said that the system needs to be changed, and moreover the mindset of the people has to change. "There are many senior people in politics. One among them is M.K. Stalin who is very able. Anbumani Ramadoss is an able administrator who has toured across the world. Thirumavalavan has been very vocal about each and every subject," he said. Rajinikanth left his fans and political circle into a speculation spree when he hinted towards joining politics earlier on Monday. Rajinikanth made the remark during first of his five-day ' Janta Darbar' which he held to interact with fans after a gap of eight years.